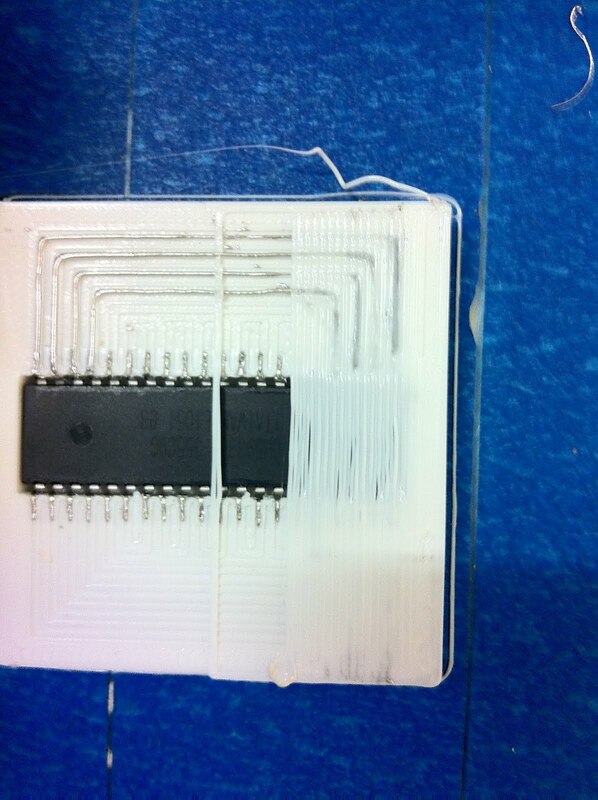 so does it look like a single run printed arduino can be cheaper than mass produced? Would it be possible to get updates like this more often? I ask because this made my day. Great work!!! This is really a game-changer technology. I agree with Zen Ferno. Please, it would be awesome if you could give us updates more often. During this week is not going to be possible for me to sleep!!! Thank you very very much :-) You made my day too! Have you tried printing solder on top of solder? I'll try to post another update in the next couple of weeks - namely doing the same board with bigger rads and trying to do the upper layer in-situ. @Bogdan We've done solder on top of solder quite a bit ago, I think I posted pics in an old blog post, although it was just standalone not part of any circuit. Anyway the bottom track held its shape but they still fused together ok. I don't think we'll get past the need for pick-and-place subcomponents for a while yet, but for interconnects integrated into structural members this looks great! Wonder if someone can build a "deconstructor" that heats the donor pcb to 120C then uses hot air and vacuum to pick up and salvage SMD parts such as resistors, using OCR to categorise them? these could then be dropped onto the build plate and solder printed up to them to secure them and act as the conductors. Hey -- awesome build!! Can anyone point out if the schematics and parts list is listed? I would love to know and try to replicate the results! Thanks! Hmm, I wonder how long it will be before we see electronics design software supporting 3d printer output. Are you manually applying flux, or using flux core solder? 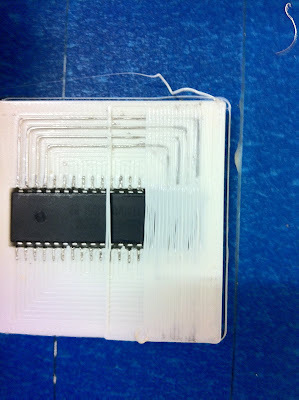 I wonder how long it will be before we can get 3d printer output from electronics design software. Just curious, are you applying flux manually, or using flux core solder? And, since electricity is pushed from source to ground, it should have more resistance if you just make one flat copper area. Or, even better, if it has a think copper area. Could you test this, and post the results? That could be your next component.